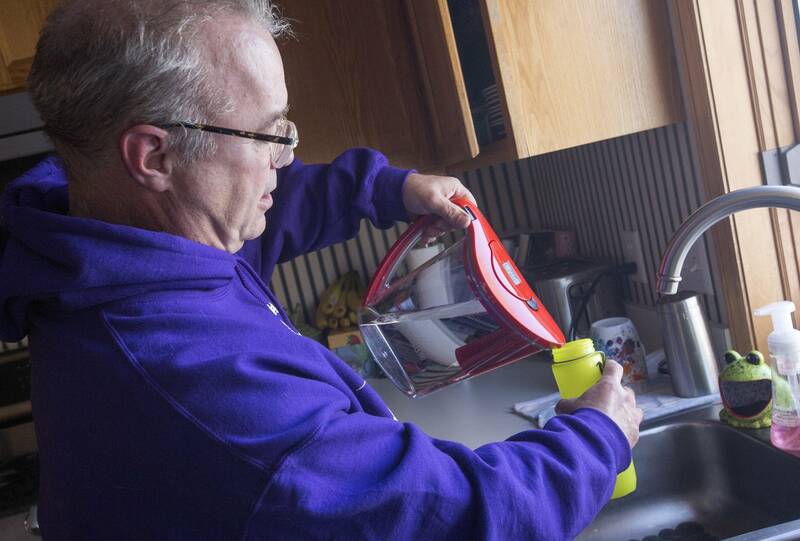 When Keith Rapp gets a drink from his kitchen, it's quite a process. The water comes in through a filter on the back of his refrigerator, then through another filter inside the fridge. From there, Rapp fills a Brita pitcher, then a water bottle with its own carbon filter in the cap. "This will be the fourth filtration of this water," he said, taking a sip from the bottle. "That's how we do water here." Rapp lives in the east Twin Cities metro where the groundwater was contaminated by chemicals produced for decades by 3M. Officially, the city water here is safe to drink. But Rapp, a hydrogeologist who deals with groundwater contamination for a living, said he's worried about the possible effects of perfluorochemicals since he first learned of their presence more than a decade ago. "I knew what the potential risks were," he said. Rapp and many others across Minnesota and the U.S. will be watching closely this week as the state's $5 billion lawsuit against 3M for polluting natural resources finally goes to trial after years of delays. Jury selection is expected to start Tuesday in Hennepin County District Court in Minneapolis. The trial is expected to last four to six weeks. The state alleges that 3M knew decades ago about risks linked to its chemicals that wound up in the groundwater in the east metro. Whether those chemicals have actually caused health problems for Minnesotans is expected to be a key question in the trial. The trial could set a precedent as 3M faces at least two dozen lawsuits related to PFCs around the country. "These cases and the ultimate potential liability for these companies I think is extremely important, and does force them to essentially consider more of the impacts these chemicals can have over a lifetime," said David Andrews, a senior scientist with the Environmental Working Group, a national environmental advocacy organization. 3M began commercially producing PFCs in the 1950s at its plant in Cottage Grove. The highly stable chemical compounds can withstand extremely high temperatures, making them valuable for a variety of products from nonstick cooking pans to firefighting foam. But Andrews said those qualities are also why they're so problematic. "Some of the properties that made them useful chemicals is they really do not break down," he said. "Conversely, it seems that very little thought was given to what happens at the end of life of these products — what happens when we have waste and release it into the environment." For decades, 3M legally disposed of waste containing PFCs in landfills in the east metro. 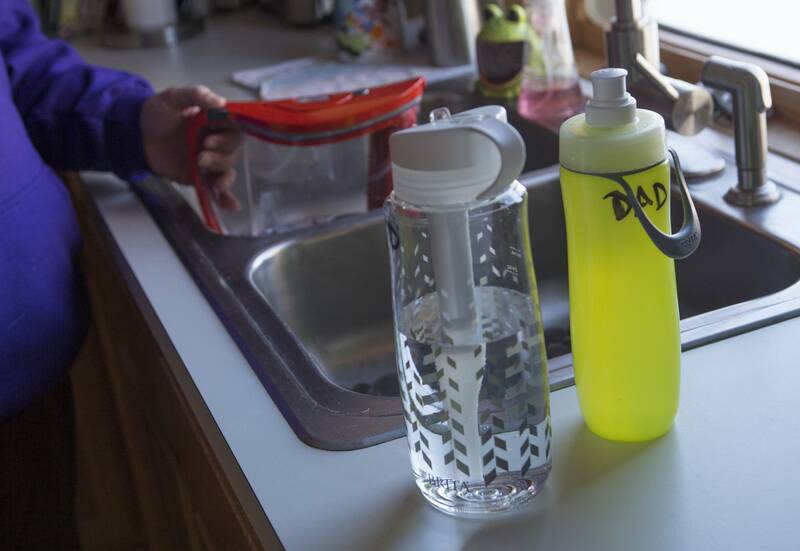 The chemicals leached into the groundwater in cities like Woodbury, Oakdale and Cottage Grove. The problem isn't limited to the Twin Cities. Low levels of PFCs made by 3M and other companies have been found in the environment and in humans and wildlife across the globe. In its lawsuit, the state claims 3M knew its chemicals were getting into the environment and posed a threat to human health long before it stopped producing them in 2002. Are PFCs toxic at the levels found in the east metro? The state's lawsuit says 3M knew from its own studies that PFCs were potentially toxic, but didn't report those findings to federal regulators or scientists. "Millions of Americans are exposed to elevated quantities of these toxic compounds, and we only discovered that at a substantial delay," said Philippe Grandjean, a Harvard University physician who is expected to testify for the state in the Minnesota trial. Grandjean is a leading researcher of the effects of PFCs on humans. His early work found that children's exposure to PFCs affected how well vaccines worked. Since then, he's studied their effects on other health problems like obesity and diabetes. "It's like almost anywhere we turn, we find something," Grandjean said. "It really looks to me like these compounds are multi-organ toxicants that can affect a lot of functions in the body." 3M declined to make anyone available for an interview for this story. In a statement, the company said it does not believe exposure to PFCs at the levels typically found in the environment or in the blood of the general population cause negative health effects. That argument got a boost days before the trial was scheduled to start from the Minnesota Department of Health. The department released new reports showing it did not find unusually high rates of cancer or adverse birth outcomes in the east metro. "What we did find is very usual variations in the rates of certain cancers," said Paul Allwood, assistant commissioner for the department's health protection bureau. 3M argues those reports undermine if not destroy the state's arguments. But the attorney general says the state only needs to prove that 3M disposed of the chemicals and knew they had the potential to cause harm. 3M has spent millions of dollars cleaning up the landfills and providing clean water to east metro residents. The company argues its disposal of PFCs was legal and permitted at the time. Even now, with a growing body of research on the risks, there isn't a consensus on safe exposure levels. In 2016, the EPA issued health advisory levels for two of the chemicals, known as PFOA and PFOS, of 70 parts per trillion. But there's still no enforceable federal standard. In Minnesota, the Department of Health last year set health advisory limits much more stringent than those of the EPA. Some cities suddenly found their water supplies were above the limit. "It was quite shocking. It happened very quickly," said Cottage Grove Mayor Myron Bailey. "We had multiple wells in the city of Cottage Grove that were deemed one day as being safe to the next day it was no longer safe to drink." The city imposed a ban on lawn watering and build two temporary treatment facilities so there was enough clean drinking water for city residents. Bailey said those fixes will only last three to five years. "The citizens of Cottage Grove — and myself included as mayor — believe that the citizens are not responsible for PFC contamination within our water system, and that those that are responsible for causing the issue should be taking care of it and compensating us for the fix," he said. The problem has been costly for some residents, too. 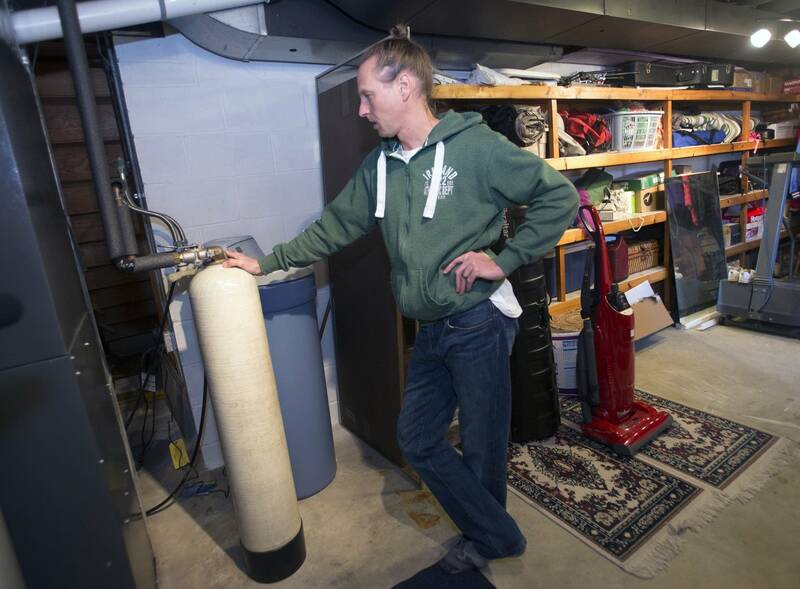 When Joby Randrup and his wife, Amy, bought their Cottage Grove home 13 years ago when expecting their first child, they knew nothing about the water situation. "We were more concerned about finding a house that would fit our family," Joby Randrup said. After learning about PFCs, the Randrups installed a granular activated carbon filter in their basement that treats all the water they use. It costs about $400 a year to maintain. Joby Randrup said he'd like to be reimbursed. "I think that's fair," he said. "If you mess up somebody's yard, if you make a mess, you clean it up. It's what I teach my kids. I'm a teacher, it's what I teach my students. Same thing, just basic morals and values. So they made a mess. Clean it up." • Have questions? How could MPR News help you and others better understand this lawsuit?